Not enough server storage is available to process this command is a message that you may receive when you try to access a shared resource on a network. The Event ID: 2011 may also be written referring to the configuration parameter IRPStackSize. If the IRPStackSize is not present in the Registry the default value which may not be large enough for the server service to administer shared folders on some of the physical drives. To solve this problem open the Registry by pressing Windows and R on the keyboard at the same time. This opens a run box on the system that you can use to load programs. Type in regedit and tap on the enter key afterwards to start the Windows Registry editor. Note that you may receive an UAC prompt which you need to accept before it opens up. 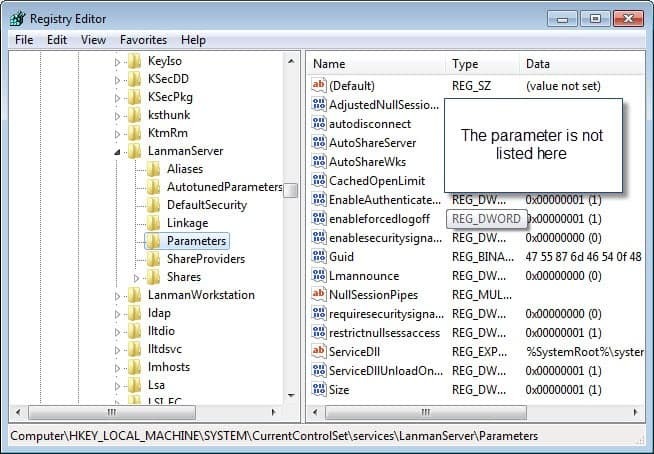 Use the folder structure on the left of the window to navigate to the following key in the Registry: HKEY_LOCAL_MACHINE \ SYSTEM \ CurrentControlSet \ Services \ lanmanserver \ parameters. Check on the right side of the screen if the parameter IRPStackSize exists. If you can't find the parameter but receive the error message then you should create it to fix the issue. To do so right-click on Parameters and select New > Dword from the context menu. Name the entry IRPStackSize. It should appear on the right once you have done that. Double-click the entry to change its value. The default value for it is 18 and you should raise it to 21 if you get the not enough server storage error. Reboot your computer afterwards and see if the issue has been resolved. If that did not do it, increase the value of the parameter by 3 again and repeat that until your issue has been fixed or you'd reach a value larger than 50. That's the maximum size of the parameter. Martin, (or anyone!) I’ve a few questions about this topic. 1. Which versions of Windows does these particular values apply to? I’ve seen this many, many times on several of my Windows 2003 servers. 2. Any idea what IRPStackSize really is? 4. Do we perform this operation on the machine hosting the share or the mean accessing the share (which would be the one to display the error)? 6. Is this related to a ‘page pool’ at all? I’d love to be able to prevent this error from crippling our operations but have struggled to find answers to the about. I found that uninstalling Macrium Reflect corrected the problem for me. I am running server std 2003, and I did not have the IRPStackSize Dword. I added it, set it to 21, rebooted the server and all fixed. Had a customer in need. All is well now. Thanks a bunch!! A very good hint, I had no clue how to get on top of this issue before I found this article. The setting was completly missing from my Windows XP pro. I was only able to connect to the shared printers, now everything is fine. Worked like a charm on my XP Pro SP3 box. Was getting the message and related event log entry until I got the value up to 24 and haven’t seen it since. Been 2 weeks. I have been struggling with the same issue for 2 weeks now…Who would’ve thought that the problem could lie in the registry? This was an awesome relieve to have it work again as it should! Thank you Martin! You’ve been a great help and wish you all the best! Worked like a charm for an XP Pro machine. Thanks! Fixed! Thank you, thank you….! I tried the fix but still no luck. Perhaps I am doing it wrong? I added the value to my laptop which is seeing the error message. I can share/see files I want from my desktop side n problem. But lately I cannot from the laptop side..HELP! Dude…thanks…was on the computer for 3hrs…many thanks!!! I get this error in Windows XP, does anyone here know how to fix this? “Not enough server storage is available to process this command” is a message that you can receive when you try to access a shared resource on a network. The Event ID: 2011 may also be written referring to the configuration parameter IRPStackSize. If the IRPStackSize is not present in the Registry the default value which may not be large enough for the server service to administer shared folders on some of the physical drives. To solve this problem open the Registry and navigate to the key HKEY_LOCAL_MACHINE SYSTEM CurrentControlSet Services lanmanserver parameters and check if the string IRPStackSize exists. If it does not exist create a new Dword with the name IRPStackSize. The default value for this Dword is 18 and you should raise the value by adding 3 to it. The first value for IRPStackSize would be 21. Reboot your computer and see if that solved the problem. If you still get the error message add 3 again and reboot your computer again. The maximum size for IRPStackSize is 50. * close out of the registry and reboot the server. Was trying to access a shared folder on a very large partition with a media player. Needles to say that as soon as I applied the above fix and rebooted, my Vista machine and my MVix media player both were able to see the contents of the share. Changing value of IRPStackSize to 21 and a reboot worked for me. I have in my computer Window vista ultimate 32bit. I have cheange till 50 but my problem is not got solve. I have tried to solve but same problem I am facing. If there is any other solution please send me email. Did he ever come back to you about this? I have the same problem, having set the IRPStackSize to 50, I still get the error message. Had to do this from the computer that I was sharing the resource. It worked great! Thanks a million! Wow! Your solution worked great for me. Both my desktop & notebook have Windows XP and both had the Dword value set at 11 so I changed them to 18. I have never been able to transfer files using the notebook. Now I can transfer files from either. Thanks a million. I had the same issue, so I just moved the page file from C drive to another partion and rebooted the server. Symantec’ s Norton can also be the cause. Removing the software solves the issue. I went to HKLM…Services and I see there are subfolders for ‘lanmanserver’ and ‘lanmanworkstation’ with similar listings underneath. Should I apply the new DWORD value under lanmanworkstation or still under lanmanserver. I also witnessed the infamous “Not enough server storage is available to process this command” last night on a friends system. 3 machines running XP Pro SP2, SP3 X 2, same workgroup. Could see the shared files from the “server” machine, but as soon as I went to a share, got the message. I was doing a Quickbooks Enterprise 9.0 upgrade for them, from Quickbooks Pro 2008. If I ran QuickBooks enterprise on the “server” machine, the clients could not connect to the share. Got the same message mentioned above. As soon as I closed out of Quickbooks on the “server” machine, the clients could connect to the share and Quickbooks. Intuit is pointing the finger at MS. They have Norton on 2 machines, and McAfee on another. My question: I added the lanmanserver DWORD reg entry on the “server” machine. It did not resolve the situation mentioned above. Do I need to add this to the clients as well? Edited the registry on my WinXP 64-bit that is acting as the host server. Had to create the dword value and used a hexadecimal value of 21. Here’s a followup to my computer not starting… It took about 5 min for my computer to load the sign on page for Windows XP. Initially, the computer would start, ask if I wanted to start in ‘safe mode’, I said yes and after many of the files scrolled over the screen, it would shut off. I rebooted three times. I am happy to say, that I am now able to access my external shared drives! I am running a xp that has three external drives and a mac. so i logged in remotely and tried to get into the Regedit and its was missing off the PC and also the Start>Run was not working. strange so i had to copy files over from my pc. and i went back into the IRPStackSize and had to increase to 24 and now is working again. What cause the IRPStackSize to stop working, and what happens once i get to 50 and cant get above? I got two computer, one HP media center box and one Lenovo X60s laptop. Both reinstalled with the same version of XP SP3. HP sharing works fine but Lenovo machine shows the above message all the time when accessed from the network. Applied above tip and magic happens! everything is working. Thanks a lot. I’ve tried this simple registy add-on and after restarting the computer everything works fine. Thanks very much for the tip. I was having the same problem. First I thought it was permissions, firewall settings, and even wireless settings. This was the trick to my fix. Thanks! Had to increase value to 18 but now it is working. Awesome fix! This registry addition solved this on two machines. Thanks. do i do this for each folder? i didnt see the IRPStackSize but when i try to create one with that name it says it already exist??? I have two USB drives (1TB & 500GB) connected to my XP SP2 machine, and was only able to access the 1TB from my VISTA 64bit machine. After applying this REGEDIT to both machines, I can now access both drives. Thanks. It worked for me. I added the IRPStackSize in Vista Home Premium, at first I typed 25, the client said that it worked for 12 hours and she received the error again on a different drive but still using the same server PC. That is why I changed 25 to 50. Hopefully, the client will not receive the error again. I too have had this problem for three weeks – and it’s really central to the way I work – so this solution was A REALLY BIG HELP. I had to set the IRPStackSize on my desktop to 18 before the problem was solved (linking a vista laptop tp an XP desktop). Many many thanks. So… I’ve got a problem with the “not enough storage to process this command” error, but the premise seems to be a bit different from everyone else here, and I can’t see how it seems to be a sharing issue as it is just my sole computer, running vista, with a cable modem being my direct internet access point. I get the error when I am trying to install the Windows Media Format 11 runtimes on my computer, and as a result have never installed said codec and been settling with WMF9 ever since I bought the computer maybe two years ago. I just did a clean reformat as part of a ritualistic cleanup process, and it doesnt matter what state the compy is in… it never has worked once. Any thoughts? I’d like to consider myself fairly computer savvy, granted no programmer, but have been kinda stumped on this one. Tried installing both with elevated priviledges and regular, no diff. Any help would be awesome! You The Man! Solution worked perfectly for me! What gets me is how in the world has this server ran for 3 years and not had this problem until now? AWESOME! Had a client with a 6 xp station network. Has been working fine for over a year. It suddenly wouldn’t see an external USB HD that is used for nightly backups. Said it was now an Internet share. This fix worked! Did it on the machine that had the external drive – rebooted – and all the other machines could see it again!!!!! Wow – had never seen this error on any system until a recent switch to a new computer running Windows 7. A backup utility reported the error when copying from an existing WinXP system to new Win7 system. Edited registry on Win7 to add the key as Decimal 21 (it was not there) and all was just fine afterwards. What I’d like to know is how on earth did Martin find it in the first place!? Hey guys! Solved the problem by uninstalling Acronis True Image . hope that will help ! Thanks – worked great…. what the heck causes this? I followed your instruction and solved the problem of two XP computers not able to share files with each other. I’m getting this message over and over on my VPS that are running Windows Server 2008, is it okay for me to change the value (regedit) to > than 15, I’m thinking of 25-30, without crashing my server? Anyone? Thanks! this resolved my issue with a SAN volume (emc) shared from a win 2k3 machine. the strange thing was that the local partition of that machine was accessible through share but the san volumes were giving this error. i even mount a different san (ibm) just to check if this is something to do with the san (emc). but it gave same error msg for ibm vol. Thanks. Was the last step to a 7 hour night. This solved it for me, too. 1. A system re-start is required after the registry edit. 2. This registry modification needs to be done on the “server” computer, not the “client” computer. Identified you blog site by way of bing I must say I m fascinated together with your discussions! Thank you for this tutorial, Now I can fix the problem of my computer. :) Thanks a lot. I got the same error (Not enough storage)in visual studio 2005. I have put the value 50 dec in DWORD in windows 7. It still doesnot work out. Please suggest me something else. YEAH!!! this worked freeking great!!! Had the same issue, right random to. The only thing new ive added to the machine was net framework 4.0 and directx, windows 32bit xp pro, and no this didnt solve it for me, it seemed to affect only the network mapped drives as well. Thanks again for the tips and thanks again Microsoft for your completely inept, moronic approach to Software Design that pervades every single application from OS’s to Paint that you develop. Thank you for making everything obtusely complex with endless extra clicks to perform tasks and retarded, non essential, Registry settings that shouldn’t be there in the first place. A Chimpanzee could have figured out that if someone wants to share a folder, on a hard drive that has more than 150 GB of space that, the full 150 GB would be available without having to jump through hoops with your cryptic messages and ridiculous settings that have to be modified in the Registry itself. Microsoft = Morons has been, is, and always will be my catch phrase for your company.